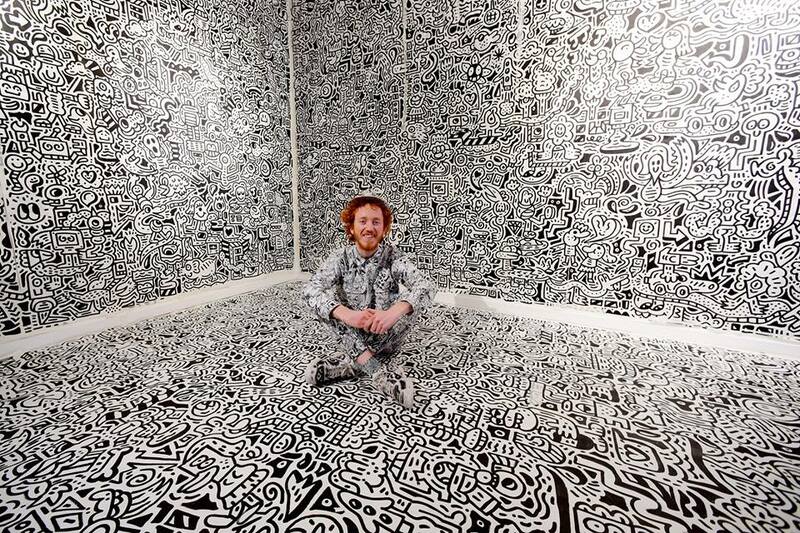 Finding Doodle Land - an Interview with Mr. Doodle - Just How Cool Is That?! Here is today's specimen to the collection of inspiring interviews with creatives who reveal exciting details of their journey and what it took to make things happen. 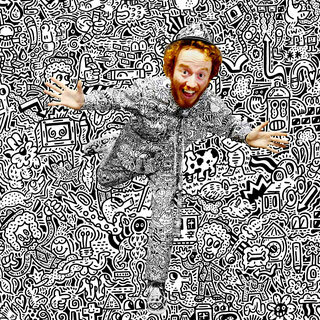 Sam Cox, or more widely known as Mr. Doodle/ the Doodle Man, is an artist, animator, designer and performer, creator of Doodleland and a fond transmitter of the Doodle virus. He bravely opposes the Anti-Doodle Squad and their Eraser Laser while trying to find his way back to Doodleland. 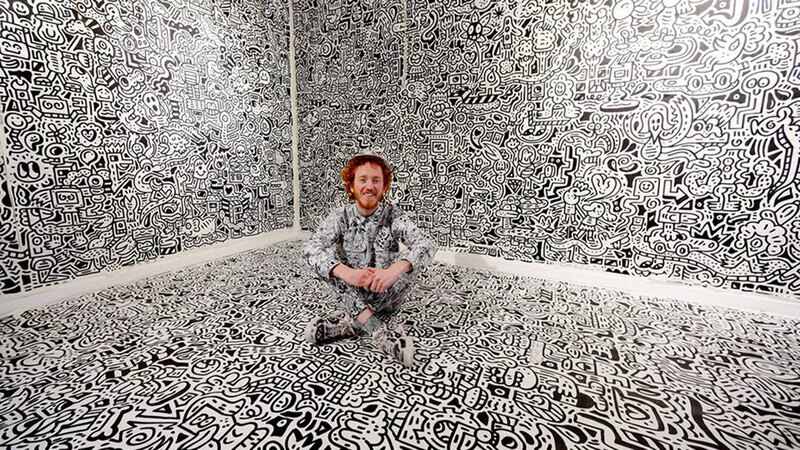 I “accidentally” met Sam on 28 April 2016 in a magically teleported piece of Doodleland at the Old Street underground station (London) where he was welcoming visitors with a friendly smile and a splash of wild ginger hair. 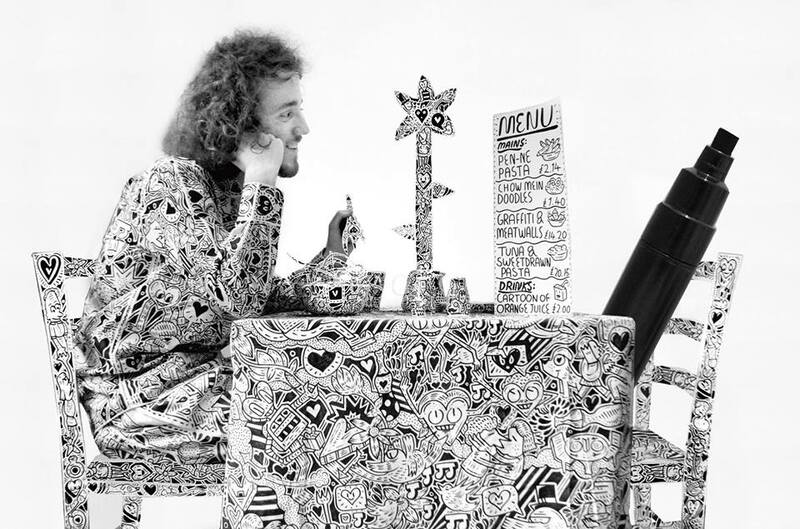 A Hitch-Hiker’s Guide to the Universe should most definitely include a chapter on the Doodle Man! At the glimpse of an eye you KNOW you have an insanely talented phenomenon in front of you and you can’t help but to immerse into this experience. 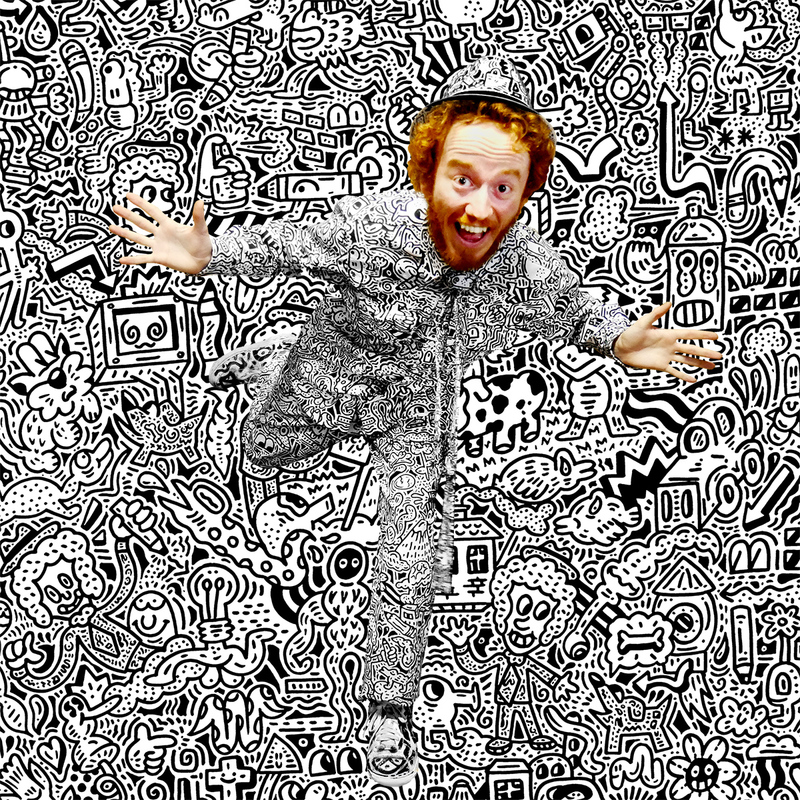 Join us on a tour behind the scenes of Doodleland where our guide is Mr Doodle himself! Hello, Sam! Thank you for agreeing to take part in Just How Cool Is That? !, the website for creatives to share and learn about the Journey behind the scenes! What is your formal training and when did you first start doodling in this distinctive black-and-white style? Were there some particular influences to it? Hey, Meg! Thanks so much for having me, it’s a pleasure to answer these questions about my work! I went to university at UWE in Bristol and studied Illustration. But I have been doodling since I was a child and always loved video games and cartoons like Crash Bandicoot and Wacky Racers, these inspired me to draw. I copied the cartoons of cereal boxes and developed my own from there. 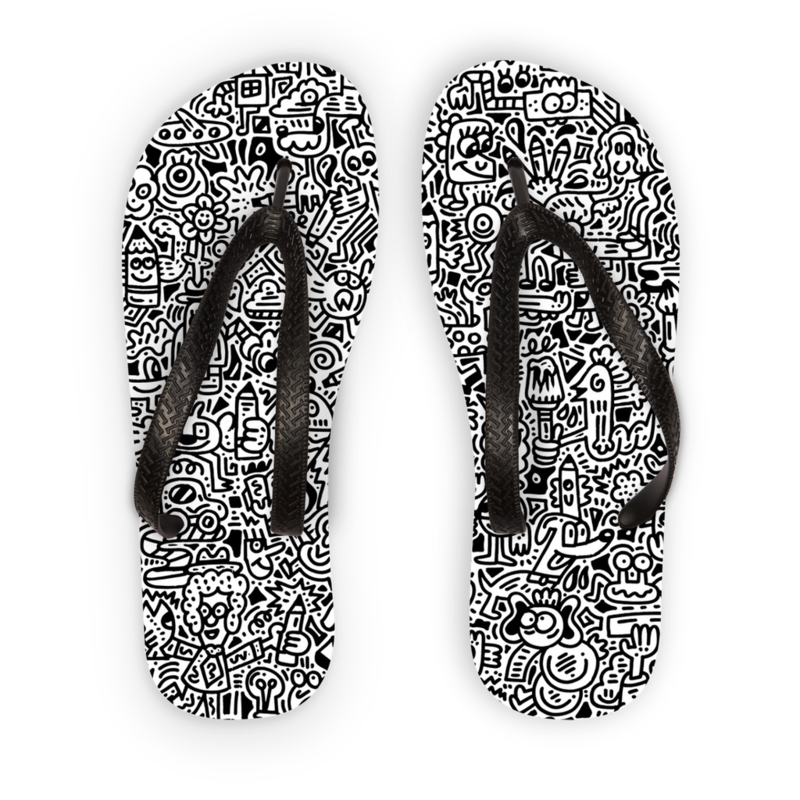 How did you come up with the idea of Doodle Land, the Eraser Laser and the whole narrative you present to the world? What were you most nervous about when putting yourself out there? What kind of support did you have from friends and family? These were things that slowly developed one by one and I combined them as I went on. So Doodleland is a place I made up to tell people where I am from when I was filming stupid videos of me trying to trade doodles with restaurants and shops for food and products. The Eraser Laser came from when I developed a ‘Surviving The Doodle Virus’ info pack to save humanity from my Doodle virus. I decided that I wanted to extend my ‘Mr Doodle’ brand in as many ways as possible and to do that I had to create friends, enemies and obstacles for Mr Doodle. So naturally I made Mrs Doodle, Doodle Dog, Dr Scribble (Mr Doodle’s evil twin) and the Anti-Doodle Squad. I was nervous mostly about dressing up in doodle gear, but then I realised that those clothes were better suited for me than my Adidas shirts and jeans etc. It just made sense for me to wear it. At first my family thought it was weird but funny and my friends thought it was funny too. They have always been very supportive I can’t thank them enough, they always show a great appreciation for what I do but also keep me in check which is perfect. You seem to be utterly productive. How long does it actually take to create one of your pieces? Do you get tired at all? How do you overcome any artist’s blocks you might have? Yeah, I love what I do so I do lots of it. Which usually means 15-16 hours a day of doodling, filming, animating, designing, selling, marketing, branding, e-mailing, everything you can imagine, there’s so much to do. What creative fields interest you? (Design, writing, drawing, music, film-making, etc?) Which ones have you practised and which ones have the greatest influence on your art? They all interest me but at different levels. I like music but I’m really bad at making music, but that can be funny in itself. I like film-making too and I think that all fields can be extra legs of my work; they don’t necessarily have to be as trimmed up as the doodling is but they can be extensions of my brand. I’m not afraid to explore those new territories because I just do what is fun. I’d say that out of those options film-making has had the most influence - I often think about things from a film perspective and how things will look on screen; I think video can be the most powerful tool. You look like a very relaxed and authentic person, not taking yourself too seriously and yet – being an example of a thriving artist achieving impressive results with your art. Which part of your work you love most and which part do you dislike most? Oh thanks haha, that’s very nice of you to say. Yeah I think it’s way better not to be too serious. I’m serious about doing this every day and working hard but I’m also going to have fun with how the work comes across of course. I love doodling the most - because that’s the core of what I do and I love coming back to it. And I love seeing people get happy when they see the work - that is really crazy and cool for me to see, it makes me feel like I’m doing more than just doodling for myself. I dislike e-mail/ admin work the most but I do see that it’s important to have a big input in that area because those are the kinds of things you have to watch to make sure your work isn’t represented in the wrong way, or you sign a bad licensing deal etc. It’s very important because it’s what people will see and associate you with. But e-mails get a bit overwhelming and I hate the fact I don’t have time to respond to all my messages on social media, but if I did I just wouldn’t have time to draw for as long as I want to. But ultimately yes there’s nothing I’d rather do, I do love it. You have a whole load of skills and talents. Have you had a point when this made you feel cluttered, unfocused or overwhelmed? Do you normally complete projects all by yourself, or you team up with other creatives? Oh there are so many things that I’m really bad at, like 3D stuff, so there are times where I do have to have help. My friend Jack at University massively helped me by building shelves for me in my final show and things like this. And I love working with film makers and musicians too. I do like to keep most of it to myself though because I want people to see what I see and I think if you have too many people involved then the work becomes a bit thin spread- even if it’s just a case of a funny way that an animation plays or music sounds. 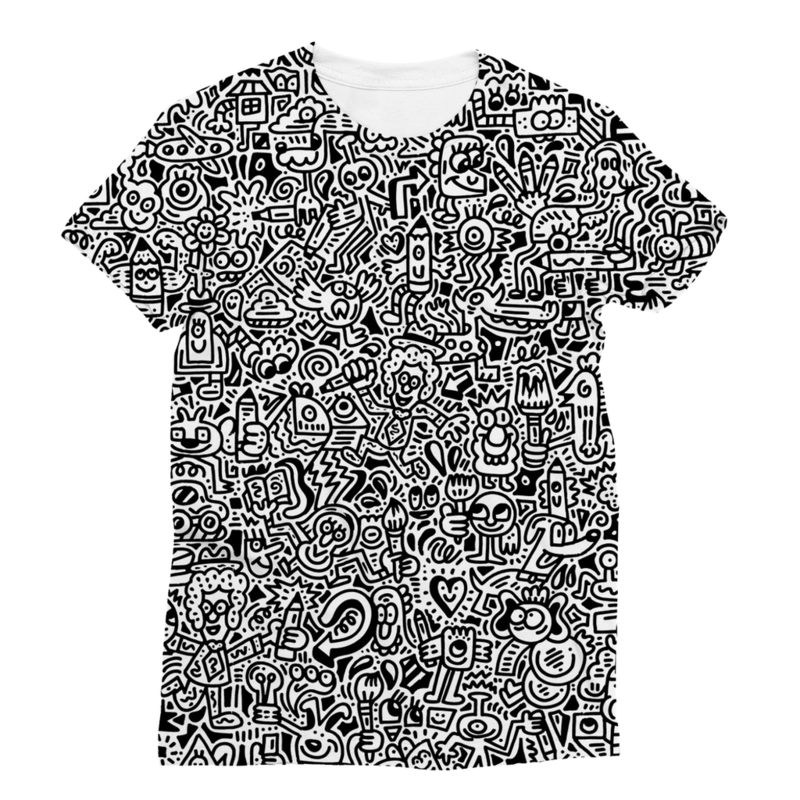 It all has to kind of fit the Doodle brand; else it won’t feel like mine. 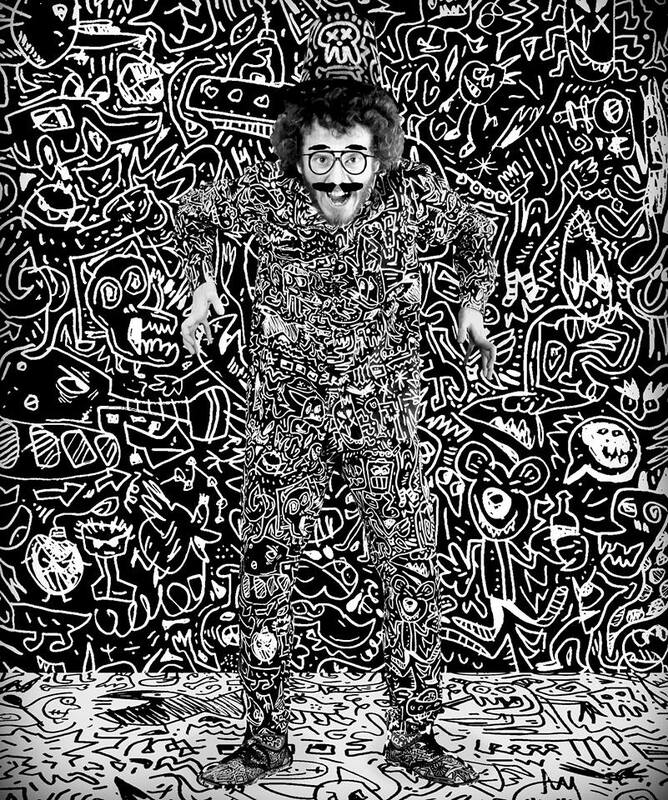 In the documentary you mention Mr. Doodle is an exaggeration of you. In what ways are you different in real life? 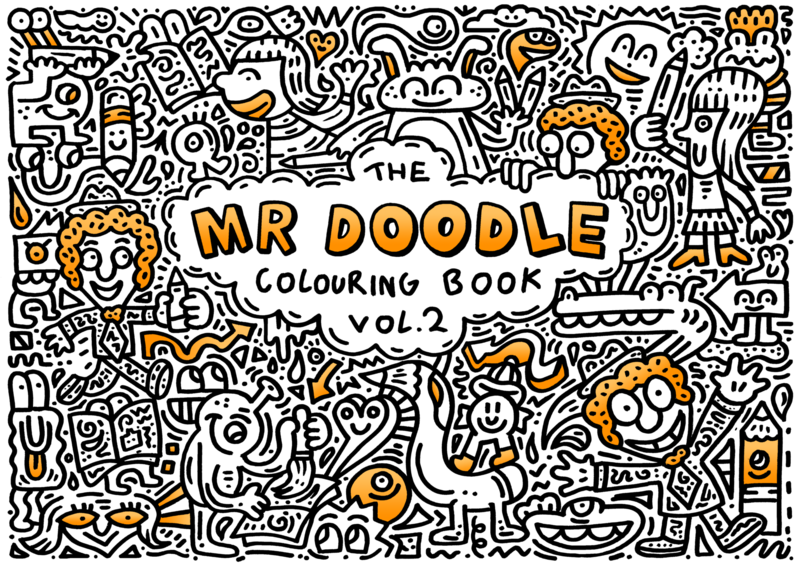 Well I think in real life I’m just a calmer version of Mr Doodle, I guess. But I do this pretty much 24/7 so there’s not really any difference. But I guess off camera I probably don’t do cheesy grins as much. 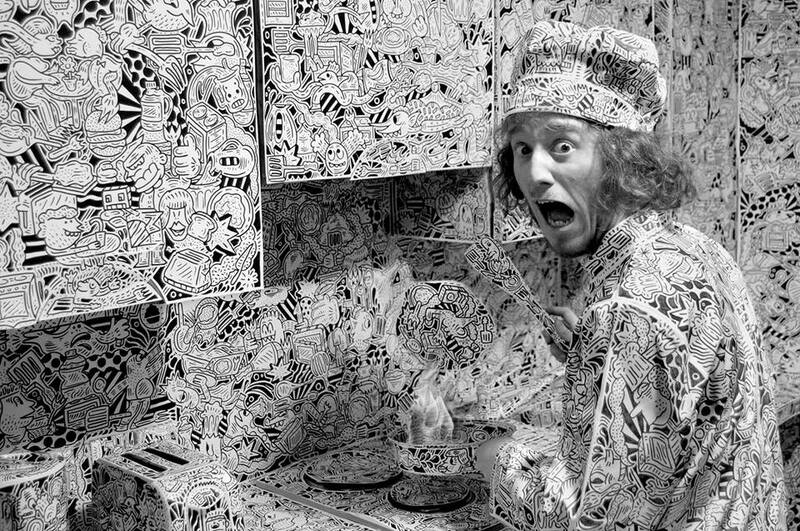 I want Mr Doodle to make people happy and I put in a lot of my energy to make that happen, whereas when nobody is there I’m not going to run around acting like a crazy Doodle man haha. Which is the most challenging part of putting together an event like the exhibition at Old Street (or similar to it)? How do you approach the gatekeepers? How many venues do you normally have to contact before you hear a Yes? With Old St, the guys who own the space ‘Appear Here’ approached me and asked if I would doodle all over it! I can’t thank them enough, it was amazing! But usually spaces and venues somehow see my work and ask me to do things like that, so I just make sure I’m very loud with my work and I’m never afraid to shamelessly self promote www.mrdoodleshop.com. I did a show in Hoxton Gallery last year and it was just after I had finished doodling a whole tunnel, so I was very tired. I had a week to put a show together and I felt a bit like it wasn’t going to work because it just wasn’t enough time. But I broke down what I had to do into a list and this made it clearer - I learnt to manage my time and things turned out much better than I imagined. I didn’t get much sleep and I learnt that I needed more sleep haha. How do you picture yourself in 5-years time? Would you have a Doodle Land theme park by that time and where would it ideally be? It’d be amazing to still be doing what I’m doing, not saying that I would get bored- that would never happen. I mean I’m loving what I am doing right now and it’s a privilege to even have that. That being said it’d be really cool to have drawn a whole town by then, or a big white mansion! I think some kind of whole Doodle house/museum by then is a realistic goal(ish). Thanks for reading about what I do, I hope it wasn’t boring and thanks to everyone who supports me, it means a lot to me. Thank you so much for taking the time to answer these questions! Hope to see you soon in Doodle Land! Doodling on Wacom tablets in Dusseldorf. 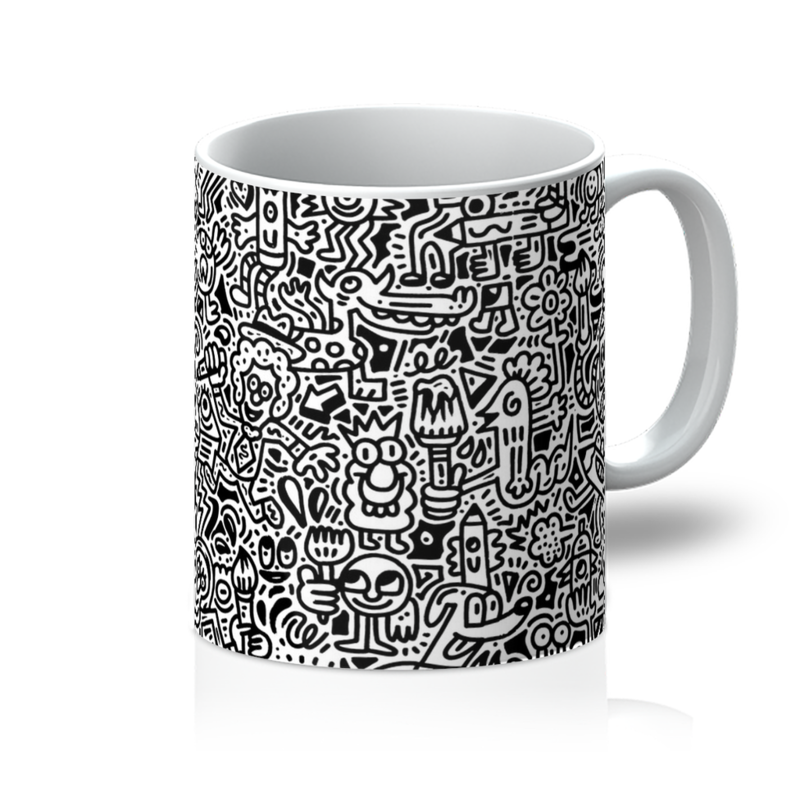 My main current focus is developing my Doodle Shop where you can purchase various merchandise, prints and original Doodle artwork. Upcoming stuff: More doodle takeovers around the world!